“How Twenty Marines Took Bouresches,” oil on canvas by American illustrator Frank E. Schoonover (1877–1972), reproduced in “Souvenir Pictures of the Great War,” The Ladies’ Home Journal, September 1919. See below for more details. The Battle of Belleau Wood, a defining moment of the First World War, was 100 years ago this month. And the journalist Floyd Gibbons was there, smack in the middle of the first wave of attacks. Like many of the Marines engaged in combat on June 6, he didn’t make it past that first day, ending up in a hospital for the remainder of the month—along with the gunnery sergeant who tried to warn away the intrepid reporter and the commanding officer Gibbons attempted to rescue on the battlefield. 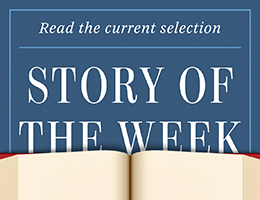 We present his riveting account of that day as our Story of the Week selection. Image, above: The original Ladies’ Home Journal caption reads, “June 6, 1918, saw one of the most spectacular bits of fighting that occurred during the Belleau offensive. Two hundred and fifty Marines, facing a terrific machine-gun fire, charged across this wheat field. The wheat, nearly waist high and still very green and dotted with poppies, was their only protection. Of this number only 20 were left to take [the village of] Bouresches, which was held by 300 Germans.” The capture of Bouresches was one of several incidents that occurred that day in the first wave of American attacks on Belleau Wood. Scan from the U.S. Military Forum.